Miami Heat forward LeBron James during the second half of Game 5 of the NBA Finals against the San Antonio Spurs. The popular narrative for the NBA Finals that just concluded is pretty straightforward: The San Antonio Spurs “play basketball the way it’s supposed to be played,” and they beat the star-studded Miami Heat in what Zach Lowe called “the triumph of the NBA’s beautiful game.” The Spurs’ offense whipped the ball around, and Miami couldn’t handle such a multifaceted attack. The Heat, on the other hand, were forced to rely on what is increasingly becoming their Big One. LeBron James was epic throughout the playoffs and had an MVP-quality performance in the finals, but the top-heavy Heat collapsed under their own weight. A variety of statistics back up this description of the difference between the two teams, if not the normative judgment. For example, the Spurs had nine different players take four or more field goal attempts per game throughout the playoffs, compared to just six for Miami. More advanced statistics show something similar. One stat we can use to see how much offensive responsibilities are being spread around is “usage rate,” which estimates the percentage of a team’s possessions that were “used” by a particular player. Possessions are “used” by making field goal attempts, getting fouled or turning the ball over. Players such as James, Kevin Durant and Carmelo Anthony typically “use” a lot of possessions because they handle the ball a lot, take a lot of shots and play a lot of minutes. And because there are only so many possessions to go around, one player’s high usage rate means fewer scoring opportunities for his teammates. 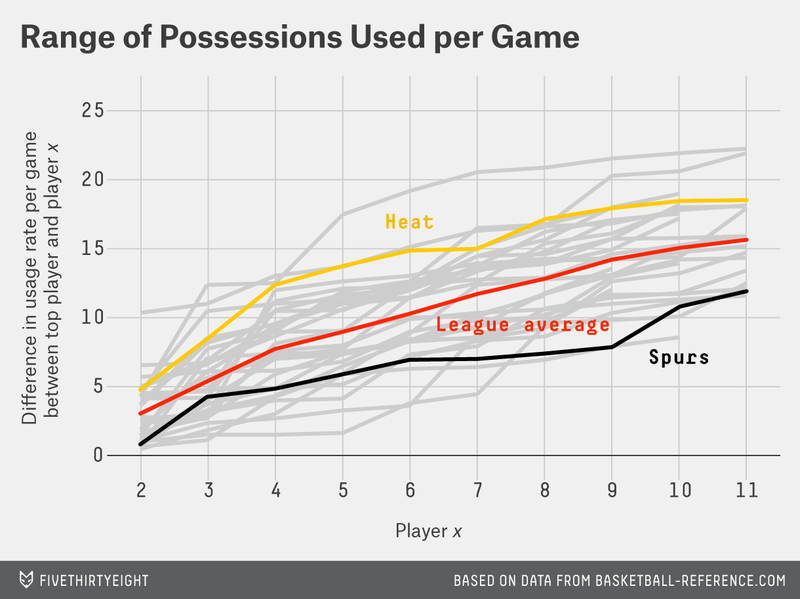 Teams like the Spurs, however, spread the ball around more, and more players get significant minutes, so they have a more flat distribution of possessions used. The x-axis on this graph is a player’s rank in a team’s usage rate, and the y-axis is the difference between the number of possessions that player used per game and the number used by the player with the highest rate. The lower the line, the more evenly a team distributes its chances across its players. Depending on how deep down the roster you look, the Heat are between the second- and fourth-most top-heavy team, while the Spurs are one of the most balanced. So that backs up the narrative. On the other hand, spreading the ball around isn’t easy, and it’s not the normal path to victory in the NBA. The most top-heavy team (and the top line on the chart) is the Oklahoma City Thunder, who had the second-best record in basketball and did better against this Spurs team than Miami did. The most evenly distributed team overall was the Brooklyn Nets, who did make the playoffs but lost in five games to the Heat. The Spurs won a lot more than we would expect for a team as balanced as they are. The 15 teams with the largest gaps between their top player and their eighth player (by possessions used per game) won 57.5 percent of their games, while the 15 with the smallest gaps won 42.5 percent (the Spurs were second-lowest). Of course, not all sharing is created equal: Sometimes a team has a more equitable distribution of possessions because it has a lot of talent and it needs to incorporate it all. Sometimes it does it because it has very little talent and doesn’t have anyone it can consistently rely on. Likewise, being top-heavy can be a result of having an overly ambitious shooter on a team, or it can just be that a team has a great player doing his job.